Tinkture feels like a snowball that I’ve been carrying around with me for most of my life, actually that’s a terrible analogy, it would not exactly have lasted very long! Let’s go with a seed instead, it’s a bit more robust! So I’ve had this seed of an idea, a feeling really, that I’ve wanted to create… something. Something beautiful, something delicate yet lasting, something creative that I guess ultimately is a public expression of our own quiet, inner dialogue. Over the years this inner voice occasionally manifested itself in physical forms, the seed was planted. There were some really interesting projects. For example, I designed an entire kids clothing line, and also small capsule clothing collections for the likes of Red Bull and O’Neill and more recently I was also a freelancer recipe developer as well as a food blogger. But each time, for whatever reason the seed just did not captivate me or hold my attention. Maybe the environment was not right, the timing was wrong or I simply did not truly nurture it enough, or want it with enough passion. And then there was also the small matter of my two young children, Huxley and Raphael. For the past ten years they’ve been my main focus and I’ve treasured being able to be there for them while they are young – it’s been such a privilege. And then Tinkture happened! And it has been fundamentally different. Right from the very start I just knew! To be honest, I never actually set out to create a Gin – it was a bit of a happy accident. From the start I really wanted to create drinks where I actually knew what the ingredients were – drinks that were delicious and clean. It felt like a coming together of everything I am interested in. Flavour, aesthetics, sustainability, provenance and originality….. and booze! The inspiration that runs through all of Tinkture was born out of spending countless magical hours with my mum and Gran (who is actually known as ‘Tink’, hence the name Tinkture!) in beautiful English gardens. I guess that is why Tinkture feels so intuitive to me, it’s not some sort of marketing exercise or cold business venture… it really is an extension of what makes me who I am and the people and experiences that have shaped my world. With regards to Rose Gin, our first product, the funny thing is, I was working on a rather different concoction (something we are still working on and are very excited about, but you will have to wait a moment until it's ready). So, I was experimenting with flavours and fresh ingredients from our garden, including English Roses - trying all sorts of different combinations, processes and distilling methods. One of these recipes was quite simply beautiful. The taste was like nothing I had ever experienced before, the subtlety of the fresh Roses and the lingering warm caress of the gin - and then, when I mixed this strange Amber Golden elixir with tonic it revealed its true colour - a delightful, subtle pink! It was just too good to ignore. So, I decided to create a small run, we made just under 1000 bottles, hoping to sell them at fairs and Christmas markets around Cornwall over the course of a few months. However, after doing just 2 autumn shows we had entirely sold out, months before Christmas was even close… and the reaction from the public was so incredibly positive, I simply had no choice but to fully commit! Once we decided to go ‘all in’ there was quite a bit of work to do and some serious soul searching. To scale up to a sustainable business, to create something genuinely original in such a crowded sea of gin was quite a challenge, and we had to make sure our points of difference were anchored in genuine purpose and vision, rather than cheap marketing gimmicks or transient trend chasing headlines. 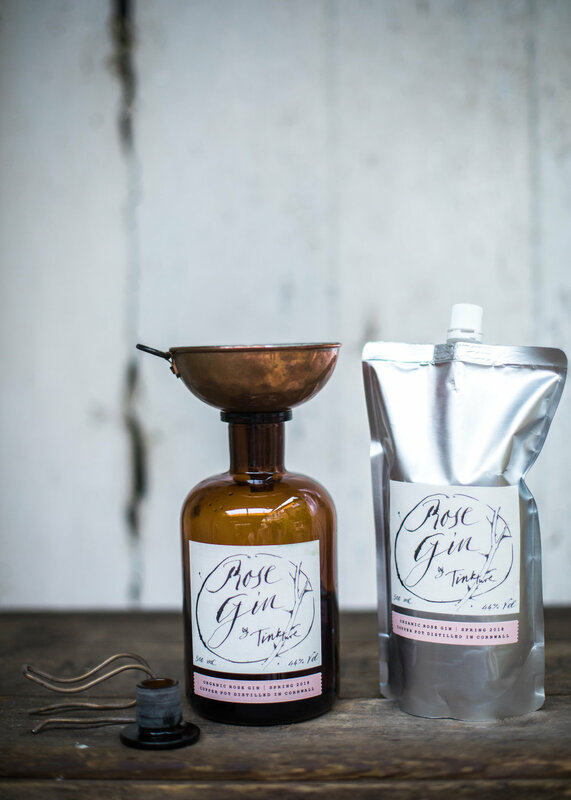 I was always very happy with our liquid, the Rose Gin just has such a unique, delicate taste and it also has interesting and subtle flavour nuances as it is naturally seasonal (we release 3 vintages each year, spring, summer and autumn – depending on when the rose petals are picked.) Our roses are exclusively David Austin varieties, grown organically in Devon by Jan at Maddocks farm organics, and picked by hand when they are ready. All our ingredients and botanicals are certified organic, just to make our gin as clean as we possibly can. And then there are our bottles. They are such a pain, so expensive and difficult to work with… but utterly worth it! We quickly realised the most sustainable way to share our Gin was to put it into bottles that you would actually Re-Use rather than throw away or recycle. We then supply Re-fill pouches to top up your empty bottles. It’s the same old story – make something properly, beautiful and use it for life – less waste, less energy and more of a fighting chance for our little planet. It sounds like grand standing or green washing, but I really think that just by being aware of how our products come into being, and then how our customers interact with them is an important small step in the right direction, and one we should all be taking.